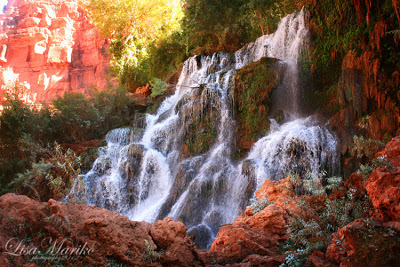 Havasupai is located on an Indian reservation in Arizona on the southwest end of the Grand Canyon. 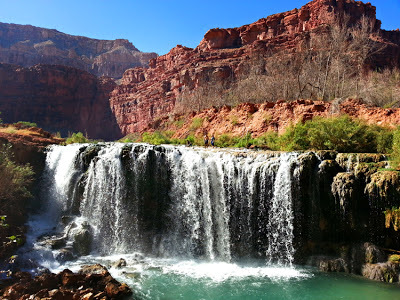 The name Havasupai means "the people of the blue-green water". 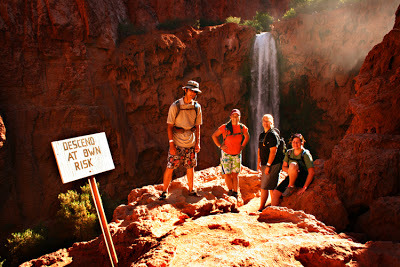 Going to Havasupai had been on my list of places I really wanted to go for a few years now. The first time I ever saw pictures of it, I knew I had to figure out someway to get there in my life time. I figured there was no better time of year to go than the weekend of my birthday in October! So I grabbed a couple friends to go on this memorable adventure with me. Once morning light broke over the Grand Canyon horizon we were all super stoked to start our 10 mile trip down to the campsite! After about 7 miles into our hike we came upon the first site of water. I knew the water was going to be pretty, but I was still awestruck at how blue it actually was. The beauty of the water down there was something I never got over. 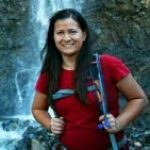 When we came upon the first waterfall (Navajo Falls) I was totally blown away. It was beautiful! I thought the first waterfall was really pretty, but when we came upon Havasu Falls I couldn't control my excitement for how happy I was to be standing in such an amazing place! I just wanted to jump into the water right there and then! After getting our camping gear all set up it was finally time to go play in the magically blue water! We first headed back over to Havasu Falls where we claimed the only picnic table on the little island in the middle and then got plenty of playing in. We jumped off the little waterfalls so many times that I lost count. We next went over to Lower Navajo Falls. When we arrived we saw a bunch of guys jumping from the falls. I knew from the beginning that I wanted to jump off as well, but seeing those guys jump off before me helped me feel more confidant that I would be safe doing it. The journey to the edge was way more difficult than I thought it would be. It was quite the jump and such an awesome feeling to know that I survived! There is a ledge behind this waterfalls that you can actually go behind the falls. So of course we did! It was so much fun to jump from the ledge and get shoved underneath the waterfall by the force of the falls! 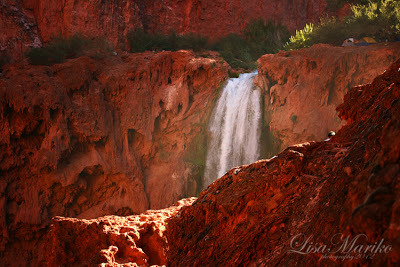 In the morning we headed down to Mooney Falls. The decent started and around every corner was something wonderful to look at! 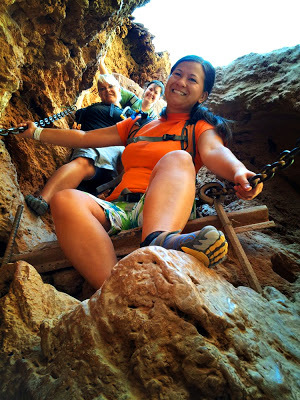 I loved the fact that we had to climb through small tunnels that opened out onto the edge of a giant cliff! After the second tunnel the only way down was to hold onto the the chains that were bolted to the cliff side and climb down. It totally scared the living daylights out of some people, but I loved every second of it! The site of the falls from ground level was just breathtaking. I absolutely loved it! 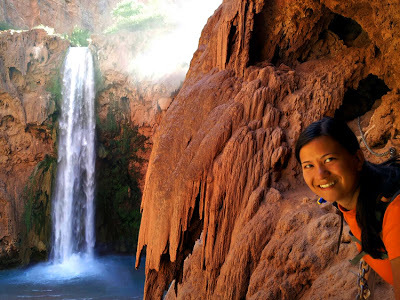 We had already gone to Lower Navajo Falls and so after hiking out of Mooney Falls we decided to visit Upper Navajo Falls. That turned out to be one of the best decisions of my life! The only way I can describe this one would be like unto something in Jurassic Park or the Lord of the Rings. It was unreal. 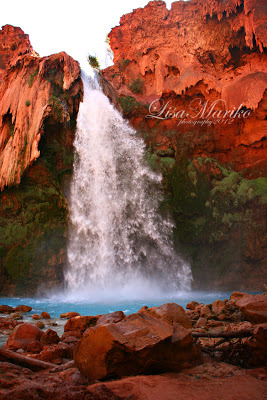 This amazing waterfall wins the Havasupai beauty contest my opinion. I just don't know how someone can be in such a place as this and not be blown away. What an outstanding creation we have been given here on earth! We knew from the get-go that we wanted to take the helicopter out. We also knew it was first come first serve and it only flew for so long. Luckily, we were 2nd in line! I was the only one from my group that had been on a helicopter before so it was really fun for me to see the excitement of my friends! It was so crazy to think that our 10 mile hike down only took 4 minutes to fly out! 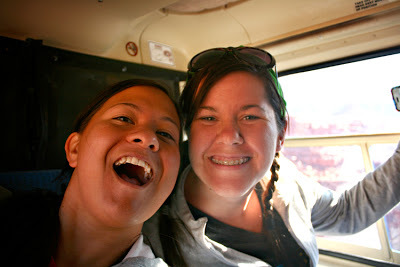 But it was such a fantastic way to view the Grand Canyon. Worth the $80 in my opinion. 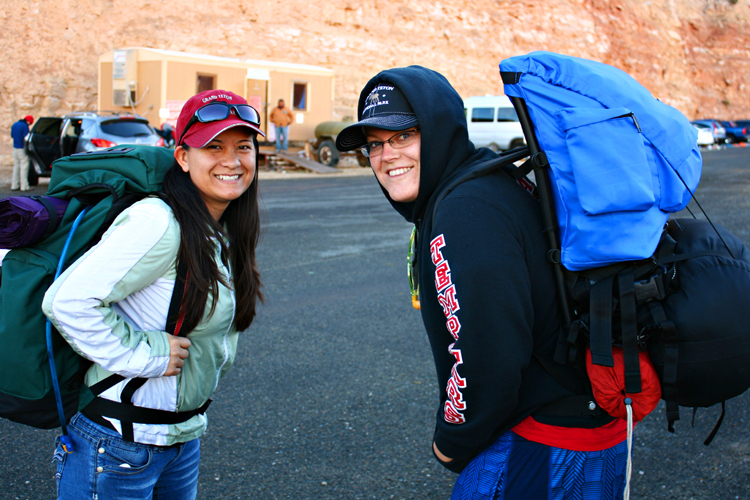 Havasupai is one trip I would gladly do again and highly recommend to anyone!